Jared Unzipped: Everything I Didn't Know About Pineapples. I have a shameful admission to make. For the entirety of my life, I have assumed that pineapples grow on trees. It's quite sad, really. Somehow, I never managed to check into the pineapple's growth cycle. Incorrectly, I assumed that pineapples grow on trees much like coconuts. Not once had I ever seen a pineapple growing wild in my thirty-three years, nor even a photo of a pineapple plant. Out of a deep desire to correct my error and give the pineapple its due, I went into full research mode. Come to find out, the pineapple is quite the crafty fruit! The pineapple is a perennial plant that grows on the ground. It can reach upwards of five feet tall, but is usually shorter and quite stocky. A bush of waxy leaves spread outwards from the base of the plant. When it comes time to flower, it grows a large stem from the center of the bush. Many hundreds of flowers blossom from the stem. As the flowers are formed and open, they eventually come together to create what we know as the pineapple fruit. Those tough prickers on the outside of a pineapple fruit are the former flowers. Over the course of nearly two years, a virgin plant will slowly mature and produce its first pineapple for consumption. After that, the process speeds up a bit, with successive pineapples being ready for harvesting in just over a year. Most pineapple growers do their best to not let the flowers become pollinated during the growth cycle. Pollinated flowers obviously produce seeds, which can damage the inside of a pineapple fruit being grown for eating. 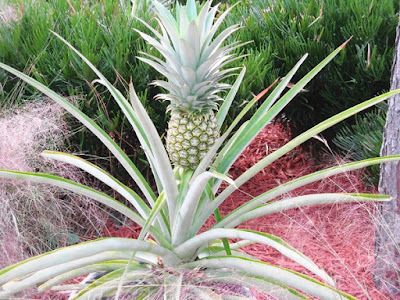 More so, the preferred way to reproduce a pineapple plant is to use the sheered top of a harvested fruit. The top of a pineapple can be sliced off and made to root, much like any other plant cutting. 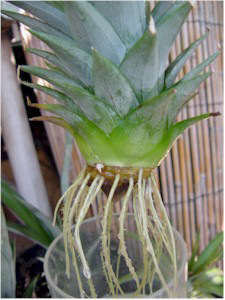 From the cutting, a new pineapple plant will grow and mature. Of note, the pineapple is a very special plant that possesses Crassulacean acid metabolism, commonly referred to as CAM photosynthesis. This is a process by which the pineapple adapted to survive in arid climates. The pineapple's stomata (pores in the surface of its leaves that control gas exchange) remain closed during the day and open at night to collect carbon dioxide, which is required for photosynthesis. Why do the stomata remain closed during the day? Well, this is a preventive measure to avoid Evapotranspiration, or the loss of water vapor through the stomata into the atmosphere. For a plant that lives in an arid climate, keeping its internal water supply is crucial for survival. Cacti and other succulents also employ CAM photosynthesis. The pineapple truly is a marvelous fruit. It can reproduce in two different ways and survive in the harshest of climates. In all honesty, I'm almost glad to have realized my misconception. I learned so much and gained a great deal of respect for the pineapple!